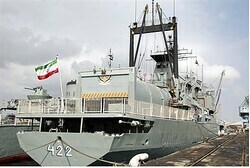 Iranian Naval Commander Habib Allah Siari declared that for the past four years Iranian naval ships have been operating in the Mediterranean Ocean, potentially putting them in range of Israel’s coast. Siari also claimed the ships were operating in the northern Indian Ocean, the Pacific Ocean, the China Sea, off the coast of Sri Lanka, and in the Red Sea. He stated all nations have the right to sail freely on the open seas, a right he claims Iran uses without threatening the naval interests or borders of others. On Saturday, Afshin Rezayee Haddad, the Commander of Iran’s Northern Navy Fleet Admiral, announced “Iran’s military fleet is approaching the United States‘ maritime borders, and this move has a message.” Apparently the “message” referred to US naval presence in the Persian Gulf. Earlier in the day, Iran warned the US that its drones and missiles could strike US ships in the Persian Gulf. Nevertheless, the Pentagon responded Monday that it was “not concerned’ by the threatening announcements,” saying the Iranians have the right to sail in international waters. It should be noted that Iran’s navy provides protection from Somali pirates for merchant vessels sailing in the Indian Ocean and the Gulf of Aden, located south of Yemen. According to the figures, Iran’s navy has accompanied thousands of merchant ships in the last four years, and prevented 150 pirate attacks. Meanwhile Iran has been trying to pick up its international business following America’s lifting of sanctions as part of an interim nuclear deal. The Islamic regime has similarly been portraying its military as the “biggest in the region” in time for the 35th anniversary of the Islamic Revolution on Tuesday. Foreign Minister Avigdor Liberman on Tuesday accused Iran of “threatening the world behind a mask of smiles” by using deceit to advance its nuclear program, an appraisal which follows the admission by Iranian Supreme Leader Ayatollah Khamenei in January that nuclear talks were indeed a tactic of deceit.